Want to help us create safe, just, and healthy communities that we can thrive in? Give to RAD this #Giving Tuesday! Next Tuesday, November 27th is a chance for you to show up and support the work of organizations that champion our values and build community. Help us raise $10,000 in one day! How? Your #GivingTuesday donation will be matched dollar for dollar up to a total of $5,000. Let’s build on the success of the midterm elections and continue our momentum of making real change: raising wages, creating a healthcare system for health, protecting public education and workers rights! We can improve the lives of thousands of people across New Hampshire and Vermont by organizing and transforming policy so that it serves OUR communities and families. 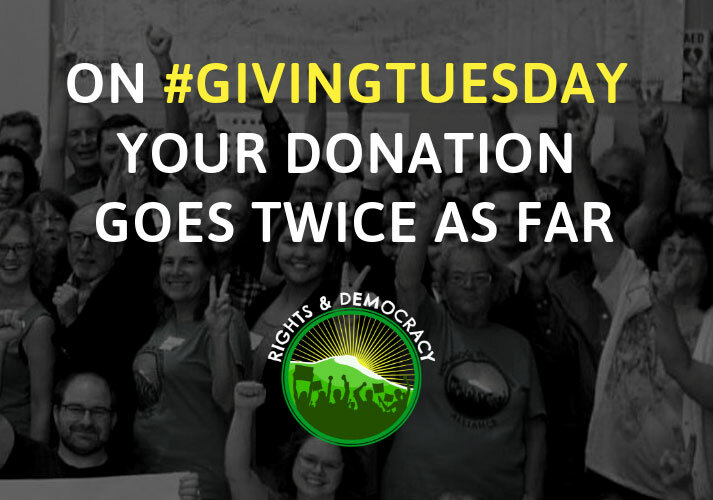 Your one-time contribution of $10, $25, $50, $100 or more on #GivingTuesday will be doubled & help us make true, lasting social and economic change through our organizing in communities across New Hampshire and Vermont. 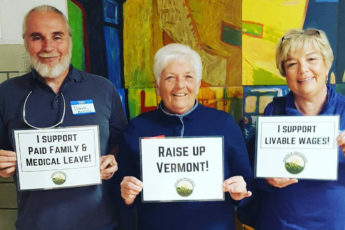 In just three years, Rights & Democracy has gone from being a scrappy startup grassroots organization with a handful of volunteer leaders and staff, to a bi-state organization that helped to secure a veto-proof majority in the Vermont House and Senate, and helped to flip the New Hampshire House, Senate, and Executive Council to Democratic control. We have the opportunity to hold Vermont Governor Phil Scott, and New Hampshire Governor Chris Sununu, accountable and work to stop the disastrous effects of the Trump administration’s policies toward women, people of color, the poor, the elderly, our LGBTQ family members and more. And, we must also continue to build momentum in order to win big during the 2020 elections—one of the most consequential elections in a generation. So consider making a one-time contribution of $10, $25, $50, $100 or more on #GivingTuesday so we can — together — build the world we want to see.